Students begin making their mark on the world by enrolling in college, entering the wor2kforce, or pursuing their dream. Regardless of the goal, being prepared is critical to success, and ACA certification helps ensure success by opening doors and providing opportunities that would not otherwise be available.Resumes with Adobe certifications get noticed and fast-tracked by hiring managers. Teachers can make their mark on the world by preparing students to do great things and with ACA certification those great things can begin almost immediately. Students are not the only ones to benefit from ACA certification. Teachers who pursue ACA certification enhance their own teaching credentials by earning an industry-recognized certification. By becoming ACA certified, teachers elevate their stature in the classroom and provide a model for students in developing employable skills through Adobe certification. And, it provides the benefits of the Adobe Certified Associate Educator program. 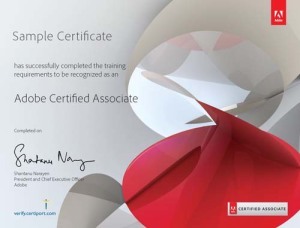 Yes, Adobe offers the Adobe Certified Associate (ACA) certification for validating entry-level skills. What are the ACA certifications available? How is an ACA certification earned? To earn ACA certification an individual must pass a rigorous examination administered through a Certified Authorized Testing Center (CATC). All ACA exams are created with input from Adobe subject-matter exerts and are psychometrically validated. Each Adobe certification exam will correspond to a particular Adobe application used for digital media communication and will represent a single certification. Performance-based questions simulate the Adobe application, requiring the student to complete a task or perform a function. Linear-based questions use traditional true/false, multiple-choice or matching formats. How can I find out what is on the ACA exams? How do I register to take an ACA exam? What is the process for a school or institution to become a CATC? What happens when I pass an ACA exam? As soon as you pass an ACA exam, your name and exam results are given to Adobe by Certiport. Your exam data is then entered into a database. Within two weeks of passing a certification exam, you will receive an official certificate in the mail with an ACA logo that highlights your accomplishment. Creative Cloud-based ACA certifications become non-current three years after date of issue. What is an ACA Classroom and ACA Campus Site License? Institutions can purchase an ACA Classroom or Campus Site License that includes unlimited use of the ACA certification exams with an upfront, one-time annual cost. The ACA Site License includes unlimited use of the ACA certifications using Adobe Flash, Adobe Dreamweaver, Adobe Photoshop, Adobe InDesign, Adobe Illustrator, and Adobe Premier Pro in all available versions. The ACA ClassroomLicense also includes practice test software to prepare your students and staff.